I had an idea this morning about what I wanted to write today. It was early after I let the dog out and was browsing Twitter and Facebook getting my brain to wake up a bit before getting ready to go to school. It was a good idea. But I think I'll be saving it for tomorrow. You see, today just didn't go as planned. I have battled TMJ issues and severe tension headaches for many years. Some days are fine, but some days are really bad. Today was the third day in a row that I've been fighting a terrible, horrible, no good, very bad headache. I went to school this morning, and shortly thereafter realized I really should have stayed in bed. I just wanted to curl up in the corner and cry I was so sick of it...which was a sign. It was getting worse as I sat there, and I knew today would not go as I had planned. So instead of writing my Slice (with that idea I loved) while my students were writing, I was instead sending emails to let people know I needed to go home early and find coverage for my afternoon classes and writing sub plans just in case I'm not feeling better tomorrow. I came home. I went to the chiropractor. I went to bed. I took a nap. I finished a book. I ate dinner. I'm feeling a bit better. Now I am just hoping it stays that way ten hours from now so tomorrow doesn't turn into another day that doesn't go as planned. 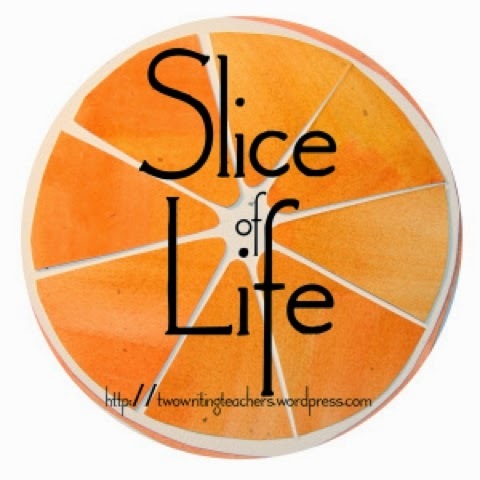 I'd like to get back to my classroom and my students - we have a lot going on tomorrow - and Slices to talk about. And now I'm going back to bed. Ouch. Feel better soon! Headaches are never fun. :( May tomorrow be a better day! I hope you feel better and tomorrow is a brighter day. I have never had those headaches so can't relate, but I am empathetic to people who have to live with such pain. I think I would be very grumpy if I had to run a classroom with a terrible headache. I hope your rest gives you renewed energy and that you feel much better tomorrow. Teaching takes so much energy to be ON the whole day. I'm glad you were able to find coverage and relief. I hope things stay in place. I hope that you feel better soon and I look forward to reading the slice that you had planned to write about today. I too suffer with headaches quite often and it really is hard to be at work when you have one. I'm glad you took time to make yourself better.